Thanks to Dr. Jonathan Douds and Dr. Kim Ely, Vanderbilt University Medical Center, Tennessee (USA) for contributing this case. To contribute a Case of the Week, follow the guidelines on our main Case of the Week page. (1) We are seeking additional pathologist authors to write the discussions of some of the pending Cases of the Week. Requirements include: (a) following our general format for case discussions, (b) turn around time of 1 week (in general) and (c) ability to write about most types of surgical pathology cases, not just a particular subspecialty. We would prefer you to meet the Author requirements indicated here. If interested, please send your CV and a writing sample of a case report or something similar to NatPernick@gmail.com. (2) Recently, a new article was posted on our Management page: "Want To Avoid Medicare Penalties Under MACRA? ", by Mick Raich, Vachette Pathology. In addition, we are highlighting Management / Billing / Consulting companies for January on our Buyer's Guide such as AdvantEdge Healthcare Solutions (AHS) and Vachette Pathology. (3) To make a Print Friendly page for any page on our website, we suggest you visit www.PrintFriendly.com and follow the instructions. It sometimes looks a little odd with the images. Another possibility is to Print / Save the page as a PDF, and then print from the PDF (easier with a Mac). Let us know if you have any other comments / suggestions. Visit and follow our Blog to see recent updates to the website. 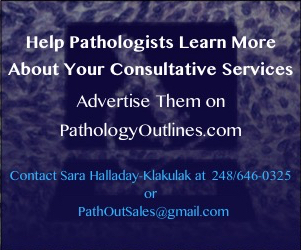 Best wishes for a wonderful holiday and a very happy new year from the PathologyOutlines staff! A 68 year old man with ulcerative colitis and chronic rhinitis had a nasal biopsy for nasal airway obstruction and septal perforation. 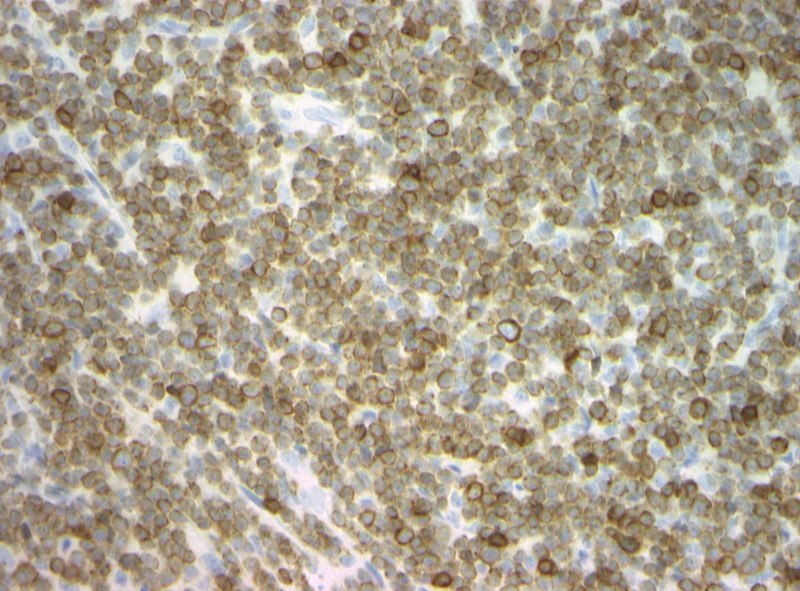 Which marker is most characteristic for NK / T cell lymphoma? 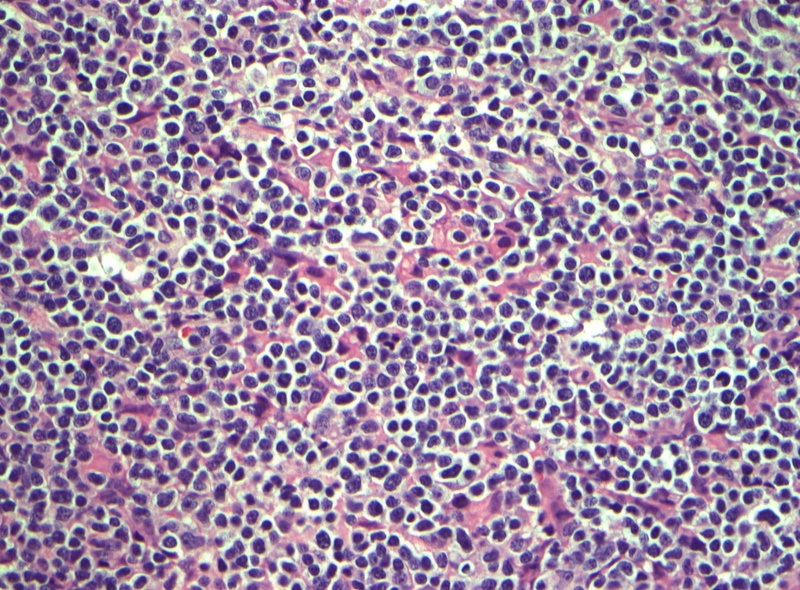 Mature natural killer (NK) cell neoplasms are classified by the World Health Organization into NK/T cell lymphoma, nasal type, aggressive NK-cell leukemia and provisionally, chronic lymphoproliferative disorders of NK cells (see also Blood 2016 127:2375). 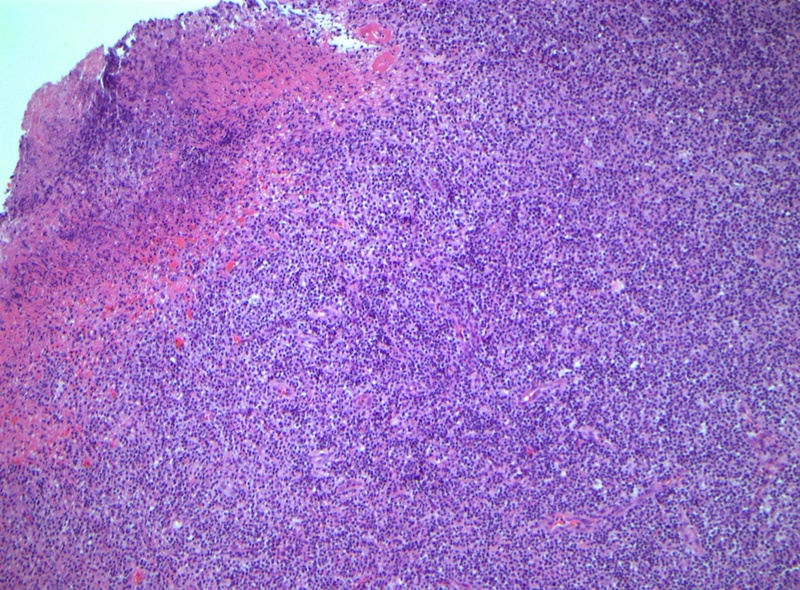 NK/T cell lymphoma, nasal type is a predominantly extranodal lymphoma characterized by vascular damage and destruction, prominent necrosis and association with EBV. It is designated NK/T cell because while most cases appear to be genuine NK cell neoplasms, some have a cytotoxic T cell phenotype. This rare tumor is more prevalent in Asians and native American populations of Mexico, Central America and South America, males more commonly than females (Am J Surg Pathol 2000;24:1511, free full text). These tumors are almost always extranodal, most commonly in the upper aerodigestive tract (nasal cavity, nasopharynx, paranasal sinuses, palate). Extranasal NK/T cell lymphomas are similar, but arise in the GI tract, skin, testis and soft tissue. Nodal involvement occasionally occurs in secondary cases, but only rarely as the primary tumor. Marrow involvement is uncommon. NK/T cell lymphomas are strongly associated with EBV, and EBV DNA titer is useful to monitor disease activity. These tumors also occur post-transplant or with other immunosuppressive states. Clinically, they often present with destructive sinonasal or midline facial tumors which may disseminate rapidly (prior terminology for these tumors included malignant midline reticulosis and lethal midline granuloma). 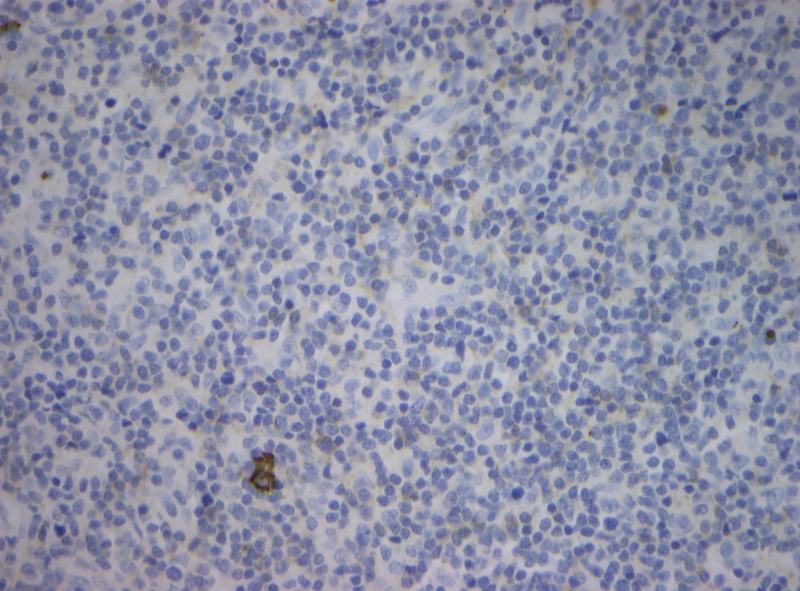 They may be associated with hemophagocytic syndromes. 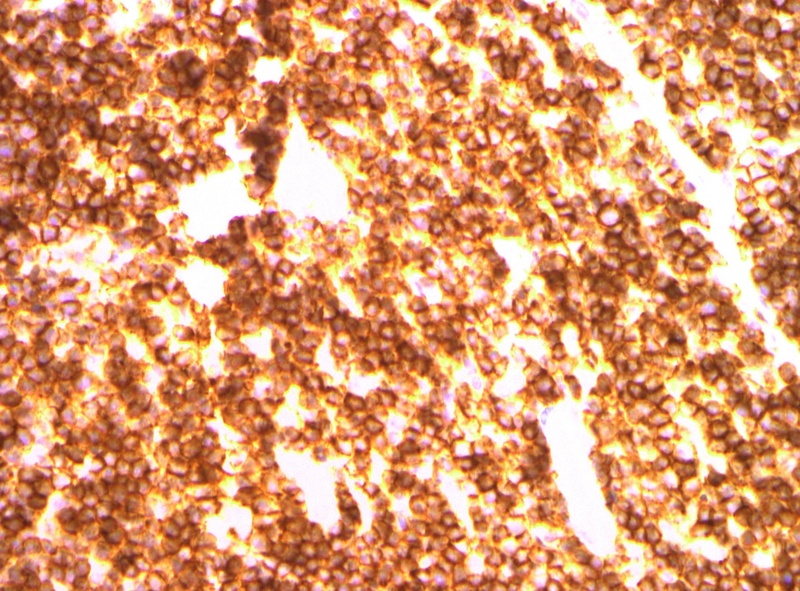 Histologically, they are angiocentric and angioinvasive with extensive coagulative necrosis and apoptosis. There also have perivascular and intravascular destructive infiltrates with fibrinoid changes of blood vessels even without invasion. 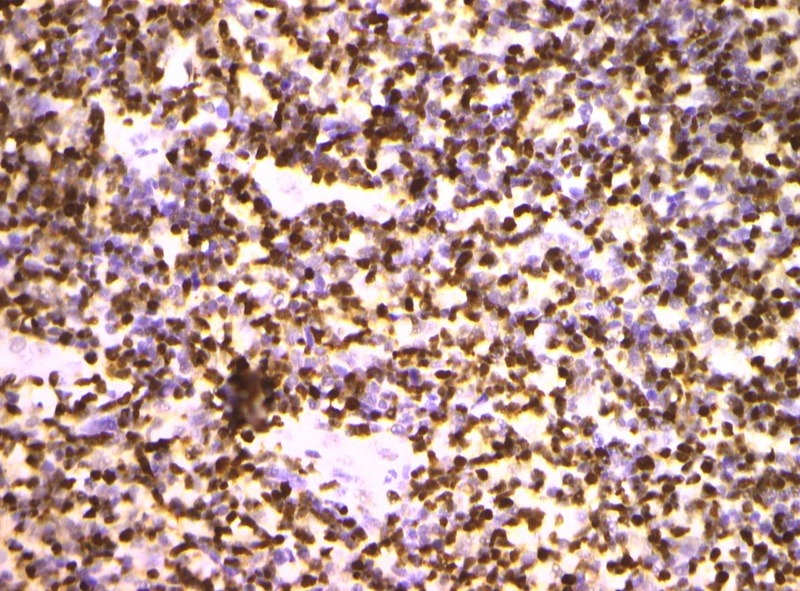 The tumor cells are atypical small and large lymphoid cells with abundant pale or clear cytoplasm, irregular nuclear borders and immunoblasts. IHC shows positivity for CD2, CD3 (cytoplasmic CD3 epsilon, not membranous, in 56%), CD45+, CD56 (67-100%), TIA1, granzyme, EBER (96%). The T cell receptor genes are in a germ line configuration. Complex chromosomal abnormalities are frequent, and loss of chromosomes 6q, 11q, 13q and 17p are recurrent aberrations (Orphanet J Rare Dis 2013 Jul 1;8:95, Diagn Pathol 2011;6:79). 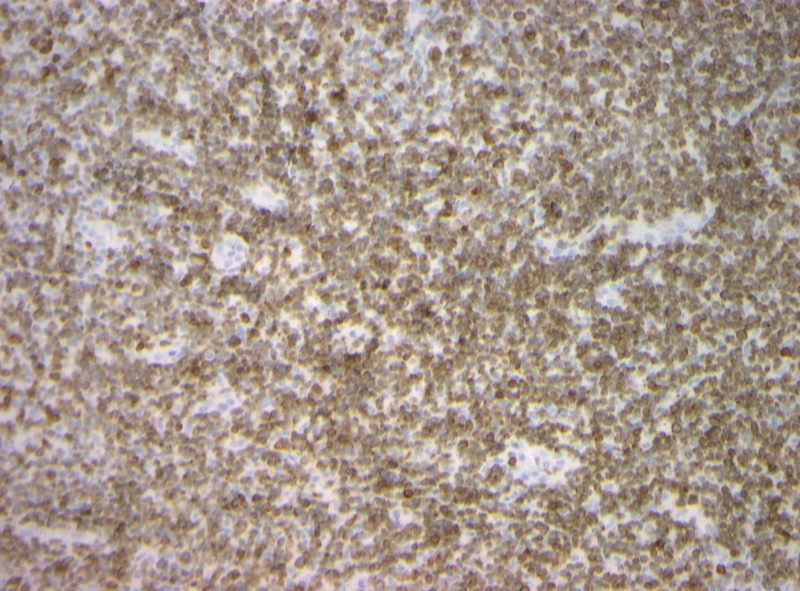 The diagnosis should be questioned if negative for EBV by IHC and ISH. Other angiocentric diseases of the head and neck include angiocentric eosinophilic fibrosis, granulomatosis with polyangiitis (Wegener's), microscopic polyangiitis, chronic cocaine usage, Erdheim Chester disease and lymphomatoid granulomatosis (Head Neck Pathol 2008;2:116). Historically, the survival was only 30-40%, but it has improved with more intensive therapy including upfront radiation. 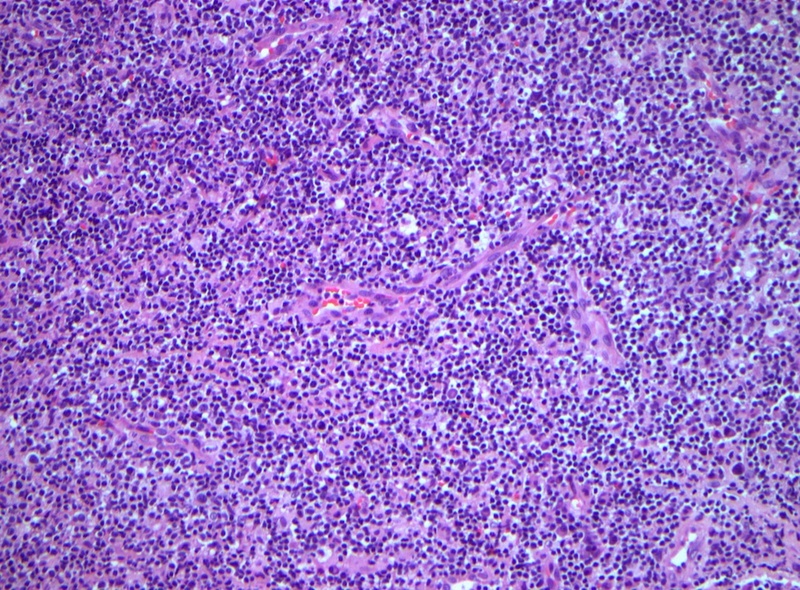 Unfavorable prognostic features include stage III-IV, skin/bone invasion, p53 missense mutations, high LDH, large cell immunoblastoid polymorphous histology (Hum Pathol 2004;35:86), International Prognostic Index of 2 or more (Mod Pathol 2004;17:1097), high circulating EBV DNA, EBV+ cells in bone marrow and possibly CD30 positivity (BMC Cancer 2014;14:890). Discussion by: Nat Pernick, M.D.